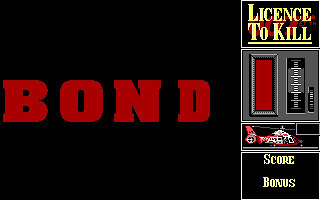 License to Kill is published by Domark in 1989, and it is based on the sixteenth James Bond film. It uses 256-color VGA graphics, but support only PC Beeper. Like Budokan, we are served with multi-track PC Speaker soundtrack. 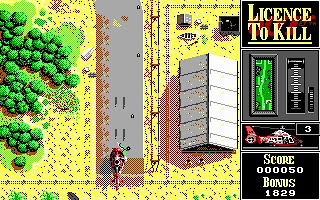 Unlike other movie adaptation, License to Kill is not an adventure game, but a shoot'em up. Anyway, it do follow the sequence of the movie. 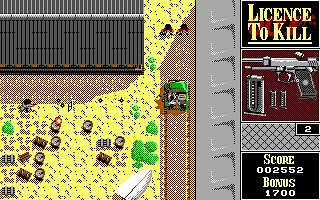 In License to Kill, we will fly a helicopter, walk on ground, swim and drive a truck, just like in the movie. 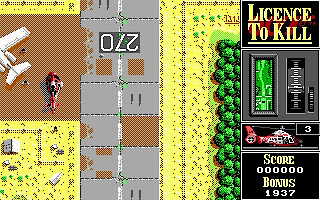 In all modes, our mission is to shoot the enemies while avoiding ourself being hit by enemies. We also need to collect ammunition as our supply is limited. At the end, we will kill the drug baron Sanchez and avenge the death of Felix Leiter. 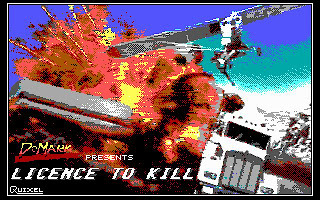 You can download License to Kill here.